These platforms are based on the STM32 processor family. The STM32 family of 32-bit Flash microcontrollers based on the ARM Cortex™-M processor is designed to offer new degrees of freedom to MCU (Microcontroller) users. It offers a 32-bit product range that combines high performance, real-time capabilities, digital signal processing, and low-power, low-voltage operation, while maintaining full integration and ease of development. The unparalleled and large range of STM32 devices, based on an industry-standard core and accompanied by a vast choice of tools and software, makes this family of products the ideal choice, both for small projects and for entire platform decisions. To support this family of processors a large number of evaluation and development boards is available. These boards are available either from ST-F or other partners from the STM32 ecosystem. 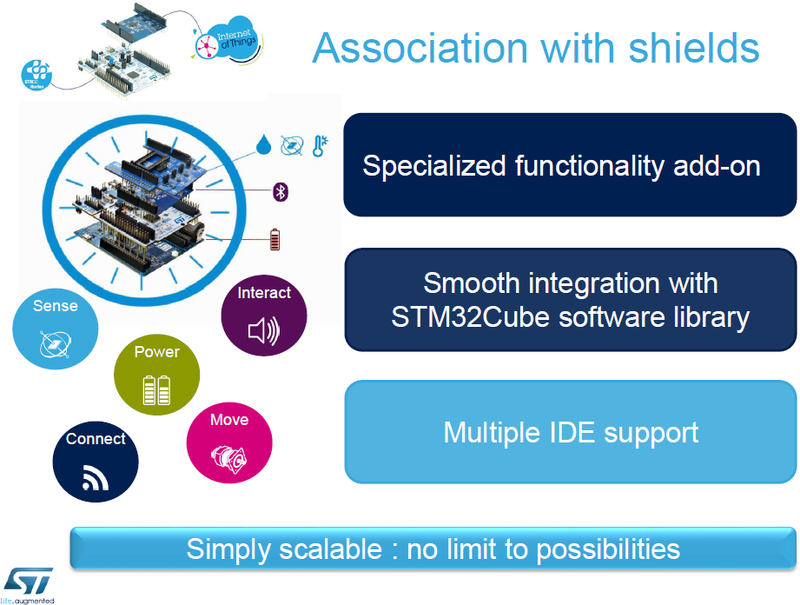 The STM32 platform can address the following application domains: automation (e.g. Human Machine Interface, Programmable Logic Controller, power management solution for industrial-Robotics or Mobile-Robotics), building technology (e.g. control heating ventilation and air conditioning systems, lights, shutters, gates, doors, appliances, security and surveillance systems…), communications and networking (e.g. systems assuring more efficient, faster and more secure solutions for voice, data and multimedia streams, based on IP and other protocols), healthcare and wellness (e.g. clinical diagnostic and therapy, medical imaging…), home appliances and power tools (e.g. motor control subsystems), and transportation (car body electronics, active and passive safety systems, steering and chassis solutions including electric steering, adaptive damper management, energy recovery in electric vehicles).